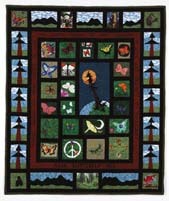 Boise Peace Project's "Julia Butterfly Hill Quilt." BOISE PEACE QUILT AWARD CEREMONY for JULIA "BUTTERFLY" HILL. 7:15pm Saturday, March 11, 2000, Boise Unitarian Universalist Fellowship, 6200 Garrett - Garden City (2 blocks north of the Chinden/Garrett intersection). Musical Tribute by Rosalie Sorrels. On December 10, 1997, forest activist Julia Butterfly Hill began the longest tree-sit in history. She endured two winters with occasional gale-force winds, helicopter harassment, and a 10-day siege by Pacific Lumber/Maxxam security. Her mission: to save the 1000-year-old redwood tree she called "Luna." Living on a cramped platform in a perpetually foggy forest, she became a symbol of commitment, courage-and climbing ability. She has been befriended by celebrities, honored by universities, lauded in songs, and flooded with gifts. Her protest attracted more attention than any other demonstration by the thousands trying to preserve the remaining 3% of our nation's ancient redwood ecosystem. She climbed the tree to draw attention to the 3,500-acre Headwaters Grove of ancient forests in Humbolt County, California, after Maxxam Corp. brought Pacific Lumber and began clear-cutting operations. She ended her tree-sit December 18, 1999, when the logging company agreed to leave the giant redwood and the other trees within a 250-foot buffer zone on the slope around it. Julia, 25, spent much of her time aloft writing poetry, doing research, and talking to the media on her cellular phone. Volunteers regularly brought her supplies, and Patagonia (a wilderness supplies company) and other contributors donated food and gear to her effort. The Julia Butterfly Hill quilt is 70"x 84." It was completed early in 2000. The Boise Peace Quilt Project has been making quilts for individuals and organizations working for peace, the environment, and social justice since 1981. Past quilt recipients include Rosa Parks, Cesar Chavez, Mr. (Fred) Rogers, and Senator Frank Church. A documentary about the project, "A Stitch for Time," was nominated for an Academy Award in 1988 and won the 1998 "World Fellowship Award" presented by the International Quorum of Film and Video Producers. The quilters are currently designing a human rights quilt to hang in the Boise City Hall. 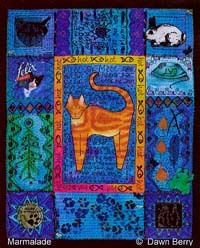 For more information about The Boise Peace Quilt Project, email Heidi Read at hread@micron.net . Tell her Lucky sent ya! Dawn Berry's GREEN QUILT "Marmalade." "This quilt measures 25" length by 20"width. It was made in 1999/2000, after doing a study of Susan Shie and James Acord's quilts for a City & Guilds Creative Studies Course. "My husband and I talked about the things we remembered and missed most about Marmalade, and I incorporated them into the quilt. "Whilst making the quilt - which took a long time and was very painful - we also lost our rabbit Buffin. Marmalade had brought Buffin home from a neighbor's garden when he was a baby, and so we had acquired a rabbit. Marmalade's sister Mackeson is also on the quilt. She's now nearly 17. "The quilt is pieced and both hand and machine quilted. It includes drawing and painting on fabric; transfer of both a photocopied photograph and a drawing done on the computer; a cat food can lid and paper wrapper; bells; beads; buttons; twigs; leaves; black bin bag and sticky back plastic. The beads include lapis lazuli, which connects the celestial and earthly realms. "Making this quilt helped us both to laugh amidst our grief. Whilst making the quilt, I included my hope that all cats (and animals) everywhere will have happy and healthy lives and loving, caring homes." 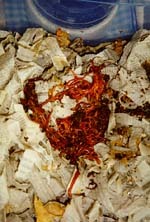 Naomi Dagen Bloom's eco-art combo: "Red Worms: Composting in Manhattan." At left: Naomi Dagen Bloom, doing a performance art piece in 1998: "Worms, Red Worms Live in My House." Naomi Dagen Bloom is an envrionmental activist artist in NYC, whose daily kitchen composting with red wriggler worms is taught and broadcast to artists and non-aritsts alike, through her installations and performances, as well as through The Dirt Museum, a travelling educational and art happening, dedicated to making city garbage into wonderful compost for returning food to dirt! Besides actually using the worms to decompose her food scraps, Naomi diligently works to train anyone possibly interested, in how to do the same. With knitting as her main artform for inticing viewers to enjoy Red Wriggler Worms as apartment friendly housemates, she's put together an amazing web site City Worm to get you going! With the closing of the NYC Fresh Kills landfill, Naomi feels a super strong need for activist change of human garbage habits. And she truly makes composting fun and ritualistic. Go check out her site, and if you can't compost in your own backyard, this will be for you!!!! At left: This is what Naomi's compost box looks like, inside of the discreet wooden box, lined with a plastic box. 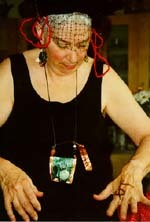 At left: Naomi in Oaxaca, Mexico in Feb. 2001. Her performance is called "Why am I Knitting Here?"